There are always a ton of little things that come across my desk each week that aren’t really worthy of a full blog post, but that I’d still love to share. Hope you enjoy this new series on bellingFAM, which will be posted every Monday… Be sure to zip me an email (bellingFAM@gmail.com) if you have something you love. I always appreciate the tips! xxoo. I’m obsessed with this chalkboard skull for Halloween. We did a Halloween Pinterest Party with the Savvy Sassy Moms team (great for Halloween ideas, if you need some!) and it was one of my favorite finds. Dishing Up the Dirt came to me via Pinterest and I’ve been obsessed ever since. I think it was this recipe for Spiced Apple Cider Champagne Cocktails that got me hooked. Loving her on Instagram, too. We chatted about this book a little on Facebook last week and I’m nearly finished. If you haven’t read Eleanor & Park, add it to your must-read list. You can grab it on Amazon. 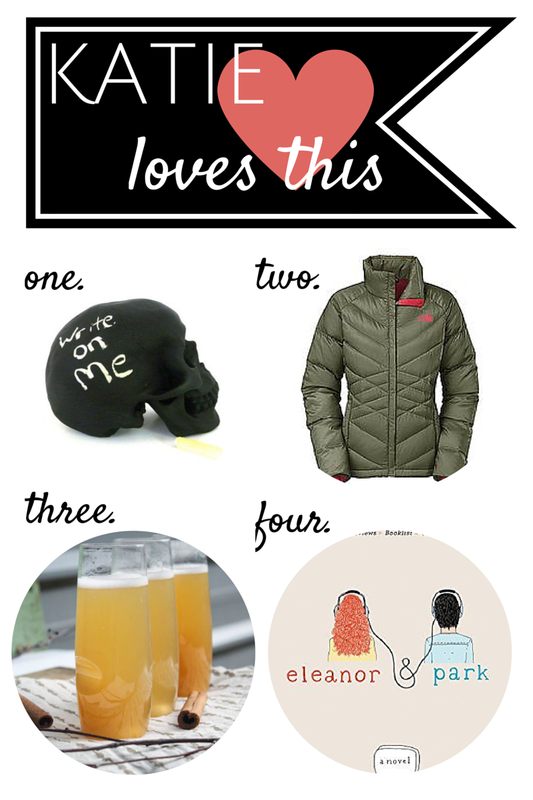 This entry was posted in Katie Loves This, Life and tagged Katie Loves This on October 20, 2014 by Katie Kavulla.